It's begun! 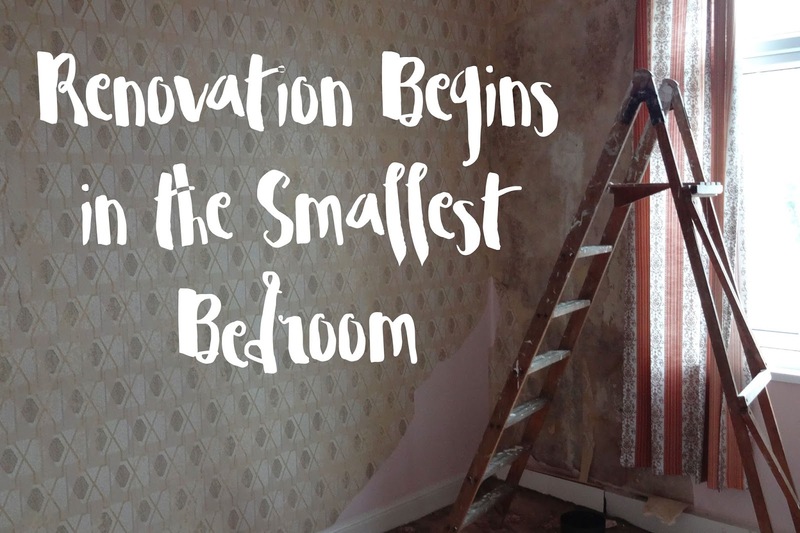 We're finally begun renovating another room that isn't the bathroom (can you say, THANK THE LORD) and I'm super excited at the prospect of having another finished room. Let's hope this one doesn't take so long, eh? We've had a pretty hard financial month. There were car repairs (oh so many car repairs) and the enormous bill that was the installation of our new consumer unit. So needless to say, I was ready to take a little spending break and do some renovation work that requires absolutely zero cost. Since we moved in 15 months ago, this room has had absolutely no purpose or use. It's literally just been a sitting box; nothing much has been in here and yes, that includes myself! I've probably stepped into this room, oh, only around four or five times. Am I joking? Really, no. I think it's seriously about time we started making use of all this space! After all, I am paying a mortgage for the luxury of it all! I think the words dark, dated and looking a little worse for wear pretty much sums this room right up. The carpet is certainly the feature of this room, which is no good thing. Sometimes I find it hard to believe this kind of stuff was ever in fashion, it's just bonkers!! Underneath the window you can see some pipes boxed in. We hope to move these under the floorboards if it isn't too problematic, although a little more investigating is required first though. One of the most obvious problems in this room was this section of the ceiling. Clearly something had once leaked here; there were water marks running down the wall and even more obvious, the wallpaper (or should I say ceiling paper!) is now hanging off. Having lived here for over a year, I can safely say (touch wood) that whatever this problem was, it had been fixed before we moved in as we've had no leaks or problems in this room. So that's the room in all it's pre-glory. And now, time to begin stripping some wallpaper. Strangely I kind of preferred the retro paper to the boring pink one. 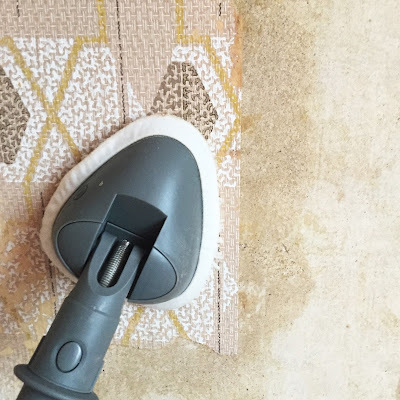 I then used my fail-safe steam mop method, which you can read about here. It works remarkably well and saves on buying a wallpaper steamer. Only negative is that it discolours the mop head badly. After a bit of wallpaper removing, I realised that the corner of the room (to the left of the window) was a little damp and the paper in that area had become completely un-stuck and with a little bit black mould underneath. Ew. We need to fix this sharpish because it causes more problems. In fact, we really need to clear all the gutters on the back of the house altogether! Problem is, due to our conservatory we can't get a ladder up to reach it most of the gutters! I guess that's a problem for next week. Some more wallpaper removing also revealed the area where the old fireplace would have sat. We hope to re-install an old fireplace back here. They really aren't half as bad as the cracks we had in the bathroom and I'm really reluctant to pull the whole lot down. That being said, lath and plaster ceilings are notorious for cracking and eventually they can often end up falling down and I don't really want that to happen either. None of the plaster is particularly loose and we don't have any other reason to pull the whole ceiling down (unlike the need to fit a fan in the bathroom) so really I think we'll just cut out the bad ones and generally fill them all. Lath and Plaster removal is not a pretty job. You can read about our previous experience removing it here and here. There are a few little areas that need need a bit of wallpaper removing - around the door and on the ceiling. But so far, the room doesn't look too horrendous yet ;) I can't wait to rip up that carpet! Any tips for clearing hard-to-reach gutters? So far my only idea was to use a hoover. Yes, really. Ideas required! Wallpaper removal is such a pain in the bottom! We have one more room to go, which I'm dreading, but new wallpaper is officially banned in our house to limit any recurrences. We also have ceiling paper to deal with - what were they thinking?! Have you thought about using a multi purpose ladder to get to the gutter? We picked up a used one on gumtree for £50 I think and its been invaluable. You can fold each section whichever way you like, but it might allow you to get over the conservatory if you bend it the right way. I know it's a bit of an investment but if you are thinking of doing your stairs any time soon it might be useful for that too. Hope you manage to sort it out! That's not a bad idea!! I totally hadn't though of that - I'm a bit of a scrouge when it comes to spending money, but it'd definitely be cheaper than getting someone in to do the job for us. I'll have to look out for a good deal and see if I'd actually be able to get around the conservatory with them too. Hope so! We actually bought our normal straight 6m ladder off gumtree for a bargain as well! Only problem was that they didn't fit in the car and being under 25, I couldn't rent a van either. So Grant had to wheel them home balanced on his bike like some crazy person. Oh, the things we do for DIY. Can you go on the roof from another spot and use a long pole to clean it out? Or maybe a chimney cleaning brush from the bottom of the downspout. The downspout unfortunately goes straight into the ground, so can't clean from the bottom without breaking up lots of concrete! As for the roof option, since we have a kitchen and conservatory extension at the back, the only way onto the roof would be from the front of the house and then climbing all the way over. But we don't have a roof ladder, so can't really get to it that way without one. I must say I kind of like that paper too, I am excited to see how you are going to do the room.